Alright I admit it. I just love 1980’s Christian Hard Rock music. There I said it. I love everything by Petra. I saw their On Fire tour a long long time ago (1991 I think) in Auckland with my mate Rob. It was an awesome experience! I haven’t spent much time in the gap. I’m the first to admit that I’m not really that good at being present. I find it hard to stop and be fully present. I’m not sure why. Perhaps it’s easier to live in the past or dream about the future. Sometimes being present, really present, is something that is necessary. Even when I write this I’m thinking about what I will do tomorrow, and replaying what I did today. It probably shows in my rambling. Over the last few months I keep running into this verse in the bible. It just keeps appearing everywhere, like when you buy a new car (OK a used car) and keep seeing the same car everywhere. So I’m trying to be present in what this verse means to me. I’ve been standing in the gap between planning what I’m doing (particularly with my writing and poetry) and waiting for God to direct my steps. It’s a curious place to be and a new experience for me. By being there and being present I’ve discovered God there too and found some opportunities for my hopes and dreams for the future, shaped by my past experiences, and honed by my present presence – in the gap. Do you have a gap you need to explore between the now and the not yet? 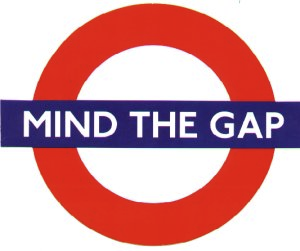 Here’s my reflection on minding the gap. And much less of me. But Lord direct my steps. As I draw from your well. As I live through your days.